Excalibur Deluxe Sword WIth Gold Finish | BUDK.com - Knives & Swords At The Lowest Prices! 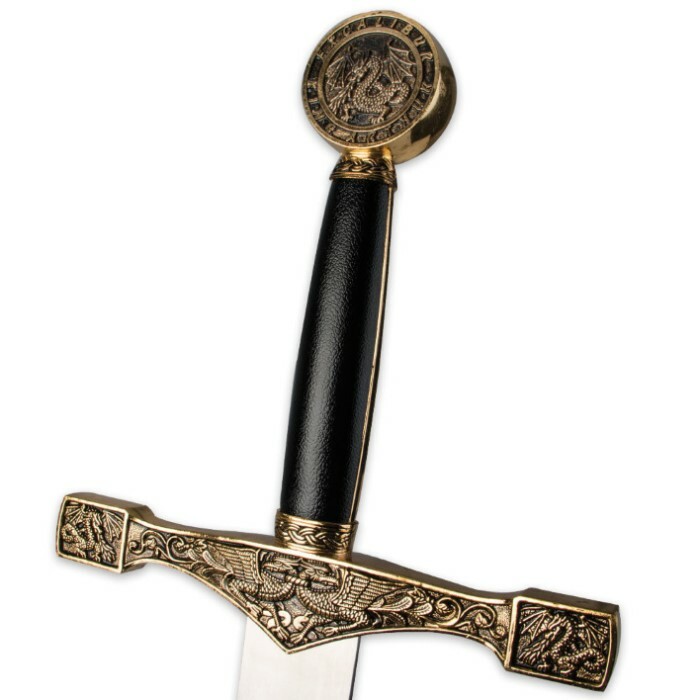 Truly mesmerizing, the Excalibur Deluxe Sword WIth Gold Finish is a must-have Medieval collection piece. It features excellent attention to detail, a metal guard and pommel, and a mirror polished stainless steel blade. A hardwood scabbard is included with faux leather covering and polished metal accents. The sword handle offers black synthetic grips with golden side panels. It is 45" in overall length. This Excalibur sword is a quality piece, big and hefty it brags it's excellence. Looks really good among the other swords on the wall and of course stands out. The hilt is beautifully done with a gold tone. The scabbard is exceptionally crafted and with the sword it's truly magnificent. Thank you. I just received my Excalibur and I have to say it is beautiful. I had one once before in my store. It came with a wall plaque, and I have to say that the scabbard sets the whole thing off. The color is better than the one I had in the store as well. I have to say that I am very glad that I got this one. I have only a handful of issues with this blade. The insignia which can be seen on both sides of the blades (while I had hoped would be laser etched) is simply painted on. This is a minor issue, however a small part of the circular portion had started to flake off when I received it (when I say small, I mean minuscule. I just thought it was worth mentioning.) The other issue is larger: as I turned the blade in my hand for the first time, I heard a small rattle from the cross-guard. that means that something (likely a chip of the guard) is inside, and more importantly, the guard, and likely the grip and pommel, are hollow. DO NOT BUY THIS AS A WEAPON!!! It is a beautiful blade that should be used as a display item only. That in mind, it is one of the best pieces in my collection. It is gorgeous, it feels nice in the hand, and the scabbard is perfect. I can't stress that last word enough. PERFECT! I can't find anything wrong with the scabbard! If you're considering this or the other version on this site, I think the extra money is well worth this sword. I got it for Christmas and I couldn't be happier with it. All in all, a great blade for the serious collector, or if you, like me, just like to carry a sword around the house every day. TrueSwords, you continue to please me as no other site can!!! Keep up the good work, and thanks all around!!! The largest broad sword from BudK. Most impressive one in my collection. Love the detailing, and the way the gold plays with the light. For some reason, I put off buying this one.....and am not sorry that I finally did purchase it. One or two more swords to go, and my collection will be complete. Thanks BudK for offering up this magnificent piece! This sword is huge and beautiful. Pretty heavy, too. The sword is in great condition and is absolutely stunning and is going to make a great show piece for my collection. Only gripe I have is the scabbard is a bit too tight, and is causing the painted markings to rub off, but other than that is is absolutely gorgeous. I'am very pleased with this purchase very good quality definitely will buy from true swords again. If you want a sword for combat keep looking but for a collection or to show off get this. It is beautifully engraved and heavy. It looks fantastic and the reason why it isn't fit for battle is because the handle isn't tough enough to withstand multiple blows and the blade would chip and rust underneath the top coat. The service was outstanding and the product is satisfying. 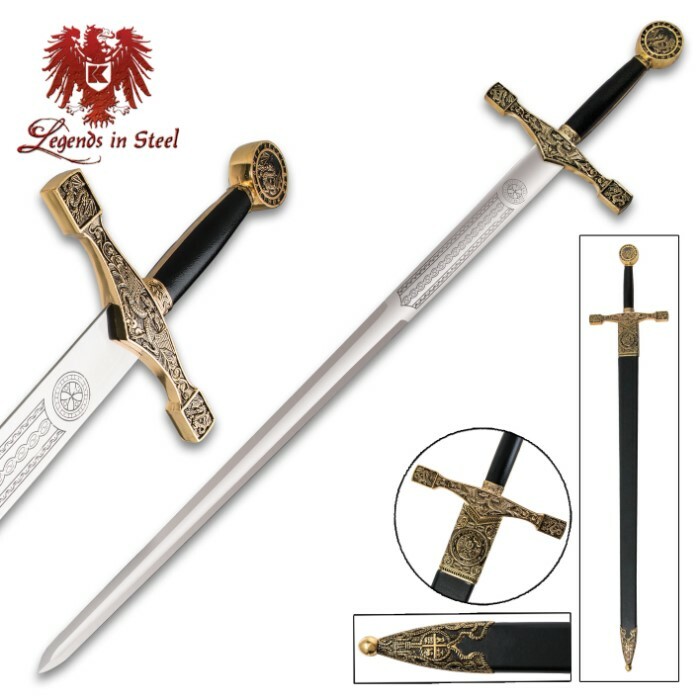 Purchased this product for my 9 yr old who has started a collection of swords and it is absolutely beautiful! I can't wait to give it to him on Christmas!